Our most popular Coin. 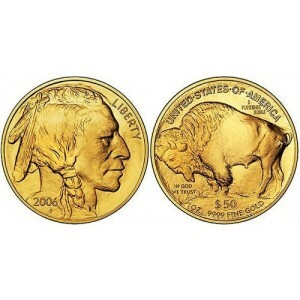 The Gold American Buffalo coin is the first (.9999) 24-karat gold coins produced by the US Mint for the public. The front side of the Gold American Buffalo gold coin features the profile of a Native American Indian, a mixture of features from three chiefs of different tribes, Big Tree, Iron Tail, and Two Moons. The reverse side of the gold bullion piece has the golden buffalo depicted with the words “United States of America”. The Bison is believed to be named Black Diamond, who lived in the New York City Central Park Zoo during the early 1900’s. Also this American gold coin keeps the recognized phrase “In God We Trust”. The Gold American Buffalo coin was introduced during 2006 as a tribute to the first Indian head coin minted in the year 1913. It follows the same theme originated by sculptor James Earle Fraser. The Gold American Buffalo is minted in the United States of America and was created in order to compete with world gold bullion coins since other countries were providing better quality bullion. Investors were skeptical about the 91.67% gold used in the Gold American Eagle, many were choosing the Gold Canadian Maple Leaf, South African Krugerrand, Gold Chinese Panda or Gold Austrian Philharmonic to meet their bullion needs. The value for the Gold American Buffalo coin is high in the gold market due to it purity of .9999 and should not be confused with the Gold American Eagle. To overcome debt issues any country depends on its gold holdings to leverage it debt. During financial crisis, precious metals are of great value as it can be sold anywhere in the world. Investing in gold is gaining popularity all over the world as gold prices keep increasing steadily. 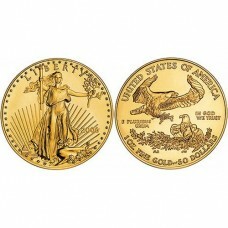 Gold bullion coins are minted by different countries and the most popular are minted in the United States of America. Many investors across the globe buy gold coins for their purity, design and ease of trade. If you are looking to acquire gold in one of it’s purest forms then look no further than the Gold American Buffalo coin. 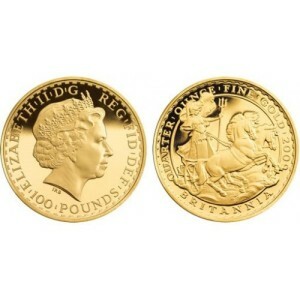 The Gold Britannia is manufactured by one of the world’s oldest organizations. The Royal Mint has been established for over 1,000 years. Making coins for Britain and over 100 other countries you can be assured of unrivalled heritage, authenticity and accuracy. Demand for Gold Chinese Panda coins have gone up a great deal in value in the recent years, as the quality is exceptionally good comparable to the Gold Canadian Maple Leaf Being one of the finest quality gold bullion coins, people are sure about their investment and good returns. 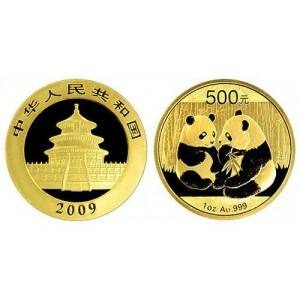 Many investors across the globe started investing in Chinese gold coins for its design and purity. It has more gold content than theGold American Eagle Bullion and the designed is favored over a plain Gold Credit Suisse bar. Gold South African Krugerrand coins are one of the most invested precious metal forms in the world because of its purity. The obverse side of the coin has the image of the first president of South Africa republic, Paul Kruger. On the reverse side is the image of the South African antelope, the date of issue, and the purity of gold printed on it. Each 1 oz Gold South African Krugerrand weighs approximately ninety-one and two thirds of gold content and eight one third of copper content. 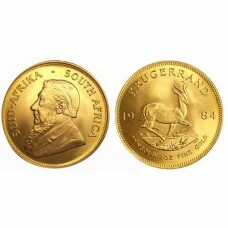 The South African Krugerrand gold coins were first introduced in 1970. Gold South African Krugerrand coins were the idea of the South African government to sell it to the international market. The South African Krugerrand coins are the first to be minted for investment purposes. To make it viable for the international community to buy these gold coins the government converted it to weight rather than denominations. The mint in South Africa never has a shortage of gold as it is the largest producer of yellow metal. The mint was privatized in 1988 and it was established as the South African Mint Company as the subsidiary of the Reserve bank of South Africa. The reason the Gold South African Krugerrand are popular is because of their reasonable prices, genuine quality and the purity of gold. The interesting part of this gold coin is that it has no face value, as its main purpose is to be traded outside South Africa. South Africa is a leader in gold mining a leading producer of gold bullion making these South African gold coins a collectors passion and is a recognized worldwide gold investment. Once apartheid was lifted the gold coins started circulating in the international market. As gold is the most stable form of investment, investors shift to hard assets as it is imperishable trading at the gold price today. In times of economic challenges, the gold price remains stable and sturdy and supports countries and business people in their time of need. As these gold coins are alloyed with copper like the Gold American Eagle, they are durable and can be easily made into beautiful pieces of jewelry. The Gold Canadian Maple Leaf coin features the bust of her majesty Great Britain’s Queen Elizabeth II with the name of the queen appearing on the top of the coin, the denomination, the date of issue is printed below the bust. The obverse side depicts the national symbol of Canada, the maple leaf, from which the coin derives its name. The reverse side has the name of the country “Canada” and identifies the 1 oz weight and purity of gold printed .9999. The print “1 OZ OR PUR” is English and French, which are the national languages of Canada and translates to “1 Pure Golden Ounce”. 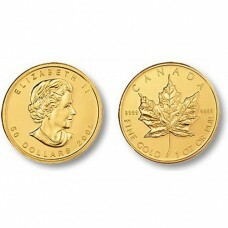 The Gold Canadian Maple Leaf coin was first produced and manufactured in 1979 from the Royal Canadian mint. The Royal Canadian mint has the distinction of being the first country in the world to commercially produce 99.99% pure gold in the form of bullion coins. Canada is also the first country to produce all four precious metals into 1 oz. coins to include the Palladium Canadian Maple Leaf, Platinum Canadian Maple Leaf and the popular Silver Canadian Maple Leaf. Before Canada started producing this bullion coin the only other option to invest in 1 oz gold was the Gold South African Krugerrand. The Canadians were the pioneers in producing pure 24 karat coin gold without alloy and became the most recognized form of global bullion coins in the 80’s. Gold Canadian Maple Leaf coins have been internationally recognized since they were introduced in 1979 as one of the best ways to hold gold. It has the highest reputation for quality minting and gold purity that rivals the Gold Austrian Philharmonic, Gold Chinese Panda, and Gold American Buffalo. Due to the current economic climate and the consistent increase in gold prices, it is a popular recommendation among those who buy gold. 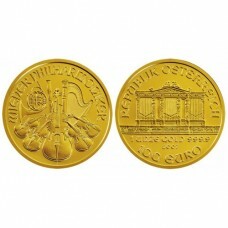 Gold Austrian Philharmonic coins are a 99.99% pure 24 karat gold bullion coin. The front of the Gold Austrian Philharmonic coin has the words “Republik Osterreich” for Austria, and the image of the great organ in Musikverein Golden Hall, home of the Vienna Philharmonic Orchestra, considered by many to be the best in the world. The reverse side of the Austrian coin are some of the instruments used by the orchestra to include the double bass, Vienna horn, harp, bassoon and violins bannered by the words “Wiener Philharmoniker”. Austrian gold coins has been quite popular in the world right from the Roman Empire period. Austria is a small place in Europe with a rich history of gold and known to produce some of the oldest gold ducat and pieces minted. Today’s Gold Austrian Philharmonic coin is minted at the historic Austrian Mint in Vienna, internationally famous for producing gold coins for more than 800 years. The Gold Austrian Philharmonic coin was first minted in 1989 and is the only legal tender gold coin mass produced in Europe. Gold Austrian Philharmonic coins was the global leader in gold billion coin sales for 1992, 1995, 1996 making it one of the most recognized gold investments in the world. Gold Austrian Philharmonic coins have a great reputation in the international gold market as they are pure gold of .9999 or 24 karats unlike the 22 karat Gold American Eagle. The Gold Austrian Philharmonic coin is the largest size in comparison to other true 1 oz gold bullion coins such as the Gold Canadian Maple Leaf, Gold Chinese Panda and Gold South African Krugerrand . Though the value of other commodities like stocks, shares and bonds were reducing during the recession, the value of gold coins have been increasing with the price of gold. The fact that the value of gold has increased steadily during recession is attracting many investors across the globe to buy gold. Individuals, who prefer to invest in precious metals choose the Gold Austrian Philharmonic coin for its purity and design. These gold coins have a face value of 100 Euros – however trade a bit more than current price of gold. Due to the overflow of gold that began pouring into Philadelphia from discovery of gold in California 1848, Congress authorized the United States Mint to create a $20 gold coin on March 3, 1849. The $20 Liberty Head is known as the most popular and recognizable coin of its day. The $20 Liberty Head, also referred to as a $20 Coronet, remained in production until 1907 when the United States Mint began releasing the $20 Saint-Gaudens. Designed by James B. Longacre, the obverse of the $20 Liberty Head coin features Miss Liberty donning a crown inscribed with the word LIBERTY. Thirteen stars representing the original thirteen colonies and the date encircle her. The reverse features a bald eagle behind a striped shield. The words UNITED STATES OF AMERICA arc around the top of the coin. A total of three different types of $20 Liberty Head coins were minted during its time in circulation. Depending upon the date and type, other pieces of information are listed on the reverse, as listed below. in 1877, the denomination was changed to read TWENTY DOLLARS instead of TWENTY D. This is the only difference between Type II and Type III $20 Liberty Head coins. 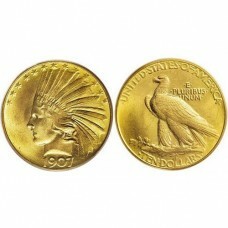 The $10 Indian Head coins were one of two coins designed by Americas most acclaimed sculptor, Augustus Saint-Gaudens, the other being the $20 Saint-Gaudens. 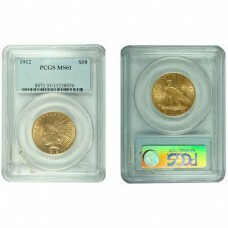 It is known by gold coin collectors and dealers as one of the most exquisite coins to ever be minted by the US Mint. The $10 Indian Head obverse features the head of Liberty, donning an Indian war bonnet that reads LIBERTY. Thirteen stars representing the nations thirteen original colonies arc above the head. The date appears at the bottom of the coin. The reverse depicts a proud Bald Eagle puffing its chest as it stands among olive branches. The Latin phrase E PLURIBUS UNUM lies to the viewers right of the eagle. The words UNITED STATES OF AMERICA and the denomination (TEN DOLLARS) appear at the top and bottom of the coin, respectively. The motto IN GOD WE TRUST was added to the coin in the middle of 1908 by order of Congress. The edge of the coin features raised stars signifying the states of the Union. Coins struck from 1907 to 1911 feature 46 stars. Two more stars were added the following year to commemorate the addition of New Mexico and Arizona to the Union. The $10 Indian was originally struck with a wire rim in 1907, which gave the coin a more 3-Dimensional appearance. Only 500 were produced before the Mint began producing regular strikes later in the same year. The Gold French 20 Franc Napoleon coin has a smooth and satiny finish and features the bare headed portrait of Louis engraved on one side with the words Napoleon III Empereur engraved around the circumference. The coin features small ridges around its circumference. On the reverse you can find 20 Francs, the value of the coin with a laurel wreath engraved around. Date is engraved in three lines. You can find the inscription Empire Francais around the wreath. Below the wreath is inscribed the mintmark A. which identifies that the coin was minted in Paris. These coins came into existence during King Napoleon I’s reign. The Gold French 20 Franc Napolean coin was engraved by one of the most skilled medalist and engraver of those days, Droz, Jean-Pierre. A six segmented collar that was invented by the engraver at the Paris mint was used to mint this coin that contained a unique edge inscription. In the year 1799, Droz was appointed as Paris Mint Coins and Medals keeper. This post was held by him throughout the reign of Napoleon. Drozs engraving of Napoleons effigy featured on the 20 and 40 Franc denominations between 1804 and 1814. Other noteworthy contributions by this engraver include the medals and Jetons for the Bank of France and the 1804 minted Napoleon coronation medals. Gold French 20 Franc Napolean coins were minted not only in France but also at Italian territories such as Turino, Genoa and Rome, Swiss territories like Geneva and Utrecht in Netherlands when French occupied these territories. The Gold French 20 Franc Napolean coins that were minted during the period of Napoleon’s reign weighed around 6.45 grams and came in 21 mm diameter. These coins contain 5.801 grams of pure gold. The value of these 150 year old coins is evident with the fact that over the last few months their premium has almost doubled. 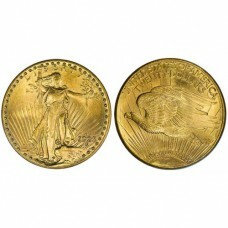 This rare gold coin takes its name from its designer, the famous American sculptor – Augustus Saint-Gaudens. In an effort to embellish the nation’s standard gold coin designs, President Teddy Roosevelt called for coins whose beauty rivaled those of Ancient Greece and Rome. Accordingly, President Roosevelt turned to his friend and Americas foremost sculptor, Augustus-Saint-Gaudens, to design new $20 and $10 gold coins. You may be familiar with some of Saint-Gaudens more famous sculptures, which include Standing Lincoln in Chicagos Lincoln Park or the General Sherman Civil War monument in New Yorks Central Park. Its name is often shortened to $20 Saint or $20 St. Gaudens within the rare gold coin-collecting world. The first $20 Saint-Gaudens gold coins ever minted were coins never intended for circulation. Only approximately 16-22 of these specimens were minted. Each coin was relatively thick and struck in what is called Ultra High Relief, giving the appearance of a medal rather than a coin. These experimental pieces had a much higher relief than later issues and connected directly to the edge without a border, resulting in a very sharp appearance. Only a few of these coins are available today. Later in 1907 and continuing through 1933, these gold coins were struck in flat relief. Although the newly minted $20 Saint-Gaudens coin was ready for circulation in 1907, an important inscription was omitted: In God We Trust (hence the name No Motto). Although our countries motto had appeared on almost every gold coin minted for the previous 100 years, President Roosevelt felt that the Lords name should not appear on coins that could be used in transactions in brothels, saloons, and gambling halls, making them close to sacrilege. At first, the Presidents order was followed: none of the 1907 and only a small portion of the rare 1908 $20 Saint-Gaudens coins included the motto. Despite his motivations, the public – and Congress – construed the omission of this motto as an attack on religion. The resulting up roar quickly led to a Congressional Act restoring the inscription of In God We Trust in mid-1908. The motto remained until the government stopped striking gold coins for circulation in 1933. 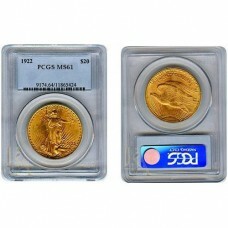 The $20 Saint-Gaudens also known as a double eagle are very popular and widely traded in the International market from collectors who buy gold. The value is higher than bullion coins as they were minted before 1933 and favored among coin collectors. 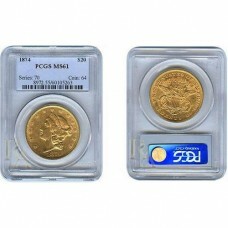 Investors worried about the grading of these rare gold coins should make sure they are certified by PCGS or NGC. The Professional Coin Grading Service, PCGS, had launched the concept of grading coins in the year 1986. Since that time they have become one of the most trusted name in certified coins. The $20 Saint-Gaudens has better luster and toning effect with very few contact marks on it. The Gold British Sovereign coin features the Elizabeth II bust encircled by the words “Dei Gratia Regina F:D”. This is Latin for By The Grace of God, Queen. On the reverse of these Gold British Sovereign coins is the image of of St. George slaying a mythical dragon. He is on a horseback and you can find the mint mark and date beneath his figure. 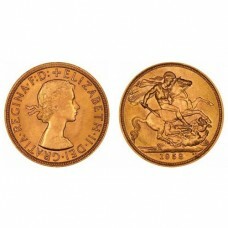 The Gold British Sovereign coins are highly valued for their rich and colorful history. These coins are known for their intrinsic value and are a collector’s favorites. They have undergone numerous transformations in overall coinage and design through ages and today is one of the largest circulating and most sought after gold investment. Gold British Sovereign were first issued for England’s Henry VII in the year 1489 and continue to be produced till date. These coins were official gold bullion pieces and featured no value marked on them, though their nominal value was 20 shillings or one pound. The very first coins minted were made of pure 95.83% pure 23 carat gold. These coins weighed around 240 grains and were very popularly sought after during that period. Minting of Gold British Sovereign coins were stopped completely after the year 1604. These were fast replaced by the laurels, unites and guineas. It was only in the year 1816 that minting of Gold British Sovereign coin was restarted by George III. The first Gold British Sovereign coins featured a crown and shield on one side with a heraldic wreath on the other. In the year 1871, this design was replaced by an art engraved by Benedetto Pistrucci which was an attractive portrayal of a dragon being slayed by Saint George. This design continues to be used on Gold British Sovereign coins till date. On the reverse, design range varied from William IV to George IV, Victoria and Elizabeth II. According to the prevailing practice, Bank of England removed half sovereigns and worn out coins from circulation and re-minted them during the Victorian period. Federal regulations made sure that gold coinsthat were offered as international payments to countries like the United States by England were melted and made into bars. Many coins were also melted in the year 1933 when they were removed completely from circulation. From the year 1932, after the coins were stopped from being minted in England, production shifted to branch mints at Ottawa, Bombay, Perth, Sydney, Melbourne and Pretoria. The year 1957 saw production being reinitiated to prevent circulation of counterfeit coins from Italy and Syria. The year 2000 saw a new demand for gold based off economic forecast and minting began again for the current Gold British Sovereign. Today, the Gold British Sovereign is minted at the Wales, Rhondda Cynon Taff and Royal Mint in Llantrsant. If you buy gold or are a coin collector the most recognized world gold coins – are the Gold British Sovereign, Gold French 20 Franc or Gold Swiss 20 Franc are highly recommended for diversifying your portfolio. Gold Swiss 20 Franc coins feature the profile of the Swiss maiden Vreneli wearing flowers in her flowing braided hair. The word “Libertas” which is latin for Liberty is seen on the head peice. “Confederatio” for the Swiss Confederation and “Helvetia”, the name of the Gaulish tribe inhabiting the Swiss Plateau prior to the Roman conquest, are inscribed in the head piece. The reverse of the coin has a Swiss shield tied with ribbons and the date and denomination Swiss 20 Francs encircled by oak branches that symbolize strength and independence. Gold Swiss 20 Franc coins have been dated back as early as the year 1492 giving Switzerland a proud history of minting the finest gold coins ever. 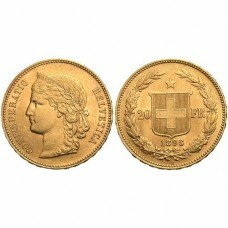 Gold Swiss 20 Franc coins were rumored to have been minted as early as 1896 and were produced until 1949 in Bern. Bern lies on the Swiss plateau in the Canton of Bern, slightly west of the center of Switzerland and 12 miles north of the Bernese Alps. It has remained neutral throughout times of war and served as a common area for finance for bordering countries. Gold Swiss 20 Franc coins are cherished worldwide for their fine gold content and excellent minting. 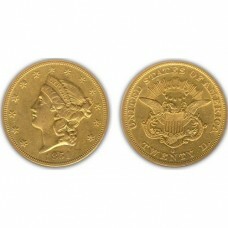 Their value changes with the price of gold as each has a guarantee of 0.1867 troy oz pure gold. They are commonly referenced as world gold coins and are globally recognized over the Gold British Sovereign and Gold French 20 Franc. Switzerland’s central location, privacy laws, and political stability have helped make it one of the worlds most important financial centers. As one of the most powerful and stable countries in the world its currency has never been devalued. Investors and coin collectors that buy gold for financial security have come to trust the Gold Swiss 20 Franc. Gold French 20 Franc Angel coins have always been a source of fascinating for many societies and cultures around the world. There is a unique feel of mysticism surrounding Gold French 20 Franc Angel coins. These legendary gold coins have always been associated with healing and protection. Augustine Dupre created the Guardian Angel design in the year 1793. On the Gold French 20 Franc Angel coin, this design was incorporated only in 1871. It is not very easy finding these Gold French 20 Franc Angel coins today as they are rare compared to the Gold French 20 Franc Rooster coins. According to the legend, Dupre, the designer of the coin was to be executed. When he was at the guillotine, he took out the lucky Gold French 20 Franc Angel coin to rub it for luck and said a prayer. A striking lightning panicked the crowd and his execution was put off for six months and he was freed later on. This coin features the winged guardian angel on one side with a candle to the left and a rooster to the right and the words Republique Francaise engraved around it. The other side of the coin is inscribed with the value of the coin 20 Francs, the mint date and a wreath around. The words Liberte Egalite Fraternite are engraved around the wreath. 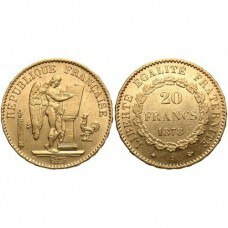 The Gold French 20 Franc Angel coins, after its introduction in the year 1792 was produced in full swing in denominations of 20 Francs from the year 1871 and was intermittently minted after that till 1898. The Angel design in the 20 Franc denomination was minted for a brief period in the years 1848 and 1849 and again between 1899 and 1906. 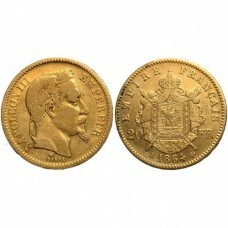 The Gold French 20 Franc Angel design is also displayed on the 50 Franc pieces that were produced between 1878 and 1900. On the 100 Franc coins, the Angel design was used from 1878 to 1899. Augustine Dupre, the designer of French Angel was saved from the guillotine as he believed due to his lucky Gold French 20 Franc Angel coin. Certain sources do not refer to his status while others proclaim him to be a noble who designed coins during the reign on King Louis XVI. Dupre holds the distinction of being appointed by the King of France to design a gold medal to honor John Paul Jones, the Continental naval officer posthumously. Stories abound about how the Gold French 20 Franc Angel coins have saved the lives of many through history. People claim they were saved by the Angels healing powers from many calamities including diseases such as terminal cancer and other tragic events. This semi numismatic coin is surrounded by an unprecedented mystic aura. Irrespective of the coins implications, it is a favorite among collectors for its sheer beauty. Gold French 20 Franc Rooster coins are collected with a passion by collectors and gold investors worldwide. One of the most important reasons for the popularity of the Gold French 20 Franc Rooster is their unique designs, affordable prices and most importantly high gold content. Non-Reportable gold coins were officially minted in France in the year 1901. They were officially known as the Gold French 20 Franc Rooster. Very fine gold is contained in every single Gold French 20 Franc Rooster that is guaranteed by the government. Every Gold French 20 Franc Rooster coin is offered to collectors as exquisite, mint condition pieces. These Gold French 20 Franc Rooster coins are legal tender that are trusted and genuine. They were minted from the year 1901 to 1914. These French gold coins are on offer today as private and non reportable both when you buy as well as when you sell them. The Gold French 20 Franc Rooster In the Middle Ages was widely used as a religious symbol, the sign of hope and faith. It was during the Renaissance that the rooster began to be associated with the emerging French nation. Under the Valois and the Bourbon kings, the royal effigy was often accompanied by this animal, meant to stand for France, in engravings and on Gold French 20 Franc Rooster coins. During the First World War, rising patriotic feeling made the Gallic French rooster the symbol of France’s resistance and bravery in the face of the Prussian eagle. Use of this Manichean representation, in particular by political cartoonists, gained ground, and the rooster became the symbol of a France sprung from peasant origins to become a proud people and gain world recognition as it own nation with global trade recognition and one of the most recognized European gold coins known as the Gold French 20 Franc Rooster. The Gold French 20 Franc Rooster exemplary design is that of the third Republic lady head surrounded by the French Revolution motto Republique Franaise facing front. This Lady Liberty was created in the year 1870 when Napoleon III was defeated in the Franco-Prussian war. The other side of this unique Gold French 20 Franc Rooster contains a plumed rooster. Words etched in capital letters around the edges include Liberte, Egalite, Fraternite. This is the phrase coined against Louis XVI during the French Revolution. The Gold French 20 Franc Rooster measures 21.0 mm in diameter. Even though these coins are rare collections, they are offered at affordable rates as they are one of the most popular world gold coins produced in Europe. They belong to a small class of globally recognized currencies which also includes the Gold British Sovereign and the Gold Swiss 20 Franc. The Gold French 20 Franc Rooster collectors covet the French Francs dating back to the nineteenth century. These rare coins are the essence of the country’s rich heritage and can be found in the most stunning designs. Each one of these magnificent pieces are a masterpiece in exclusive French design and art. If you are a coin collector or an investor, Gold French 20 Franc Rooster should be a part of your collection. It is considered a smart investment to purchase these affordable coins that come with a strong guarantee from the government. 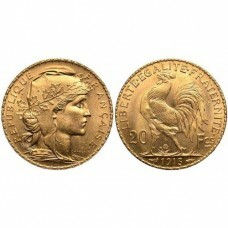 Add in some precious and valuable Gold French 20 Franc Rooster coins to your coin collection.